The first and only patented binoculars to incorporate two different types of rubber to improve durability, shock-absorption and comfort. 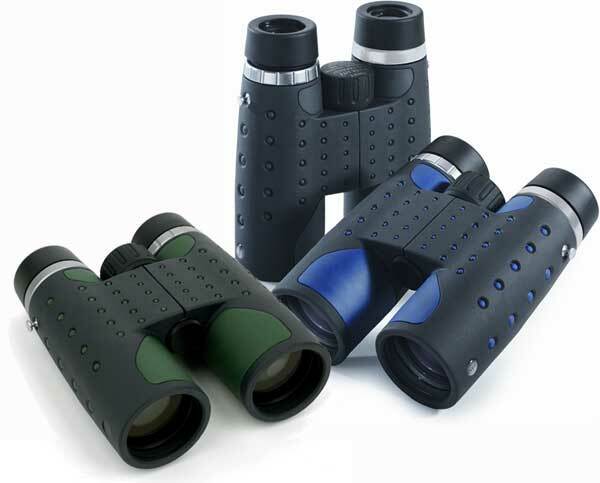 The hard exterior rubber protects the binoculars against bumps and bangs while the soft interior rubber and patented ergonomic design gives the user added comfort and reduces user fatigue. The soft interior also provides a sure grip in any weather condition, wet or dry. This same technology is used to create a non-slip focusing knob on these binoculars. The Ultra Collection offers premium optics and features the finest BaK4 prisms, new SHR (Super High Resolution) full multi-coating technology with additional layers to provide greater light transmission than standard multi-coatings, long eye-relief, close focusing and durable waterproof construction. Complete with a neoprene neck strap, rainguard and objective lens covers, microfiber lens cloth and padded field case. Available in one of 3 colors: Blue, Gray, or Green.